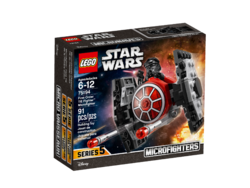 75194 First Order TIE Fighter Microfighter is a Star Wars Microfighter set released in 2018. This is a description taken from LEGO.com. Please do not modify it. (visit this item's product page) Recreate action-packed space battles with the First Order TIE Fighter Microfighter. 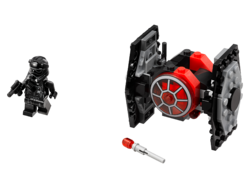 This LEGO® Star Wars toy features 2 flick missiles, space to seat the included First Order TIE Pilot minifigure with his blaster pistol, and red detailing from the craft featured in the Star Wars: The Force Awakens movie. Go up against the 75193 Millennium Falcon Microfighter for even more Star Wars fun! 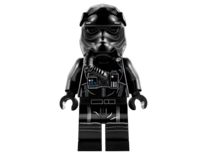 Facts about "75194 First Order TIE Fighter Microfighter"
This page was last edited on 9 February 2019, at 22:10.